My very FIRST Bridal System follow-up email that went out to my bridal show leads got a 46% open rate in less than 24 hours! Bridal shows are expensive in both time and money, you never know what kind of leads you’ll get, you don’t know if anyone will actually show up and lastly, you don’t know if you will get any bookings from them. Don’t spend thousands of dollars and waste your time on another show! You’re going to follow up and work that list like a pro!! The average engagement lasts between 13 to 18 months, that is a long time to pursue a lead but if you are a romance travel specialist you have to stay front and center of that bride for over a year! Participating in a bridal show is only the first step in marketing and selling to those brides. A follow-up system is CRUCIAL to closing sales and staying top of mind for those couples. “But I don’t want to bother them,” you say, well if you are selling widgets you have to market until you close those sales. You’re a marketer and sales person first, without sales there’s no profit. The next time you feel like you don’t want to “bother” a prospect you need to rethink your business plan, or better yet, give yourself a reframe! 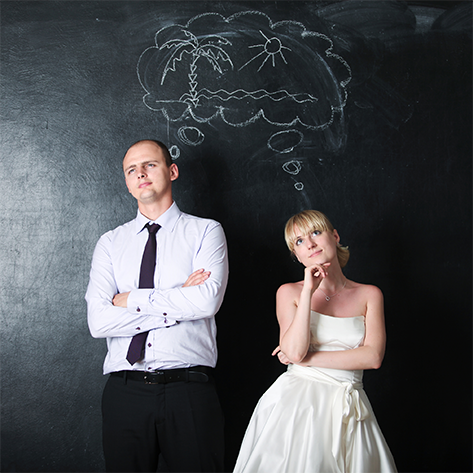 If you believe that your services are of great benefit to newlyweds, then it’s your duty to get out and meet as many soon-to-be newlyweds as possible and educate them on why using your services is a smart decision that will positively impact their lives. Think about it… the experience they have on their honeymoon is something they are going to remember FOREVER! If you don’t properly market and sell your services, you will be robbing dozens and dozens of newlyweds from having the best honeymoon experience possible. Don’t be a thief! Instead spread the love by properly marketing and selling your services. Your first step is to research, sign up and participate in bridal shows. Your second step is to set up a proven and automated follow-up system (which we would love to handle for you! More about that in a minute). If you’re not going to follow up with all of the leads you get from the bridal show, don’t go! It will be a complete waste of your time and money. If you don’t yet have an effective follow-up system in place, you are missing out on tens of thousands of dollars in bookings. Don’t believe us? Check out these stats from the National Sales Executive Association. 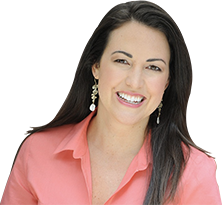 So when you spend a bunch of time and money doing a bridal expo, if you don’t follow-up with your leads 5-12 times, you are missing out on a HUGE amount of new clients. We realize that setting up an effective follow-up system can be a daunting task, so how about we handle it for you? We developed a proven and tested bridal expo follow-up system and we would LOVE to set it up for you for a small one-time investment. If you get just ONE new client from this proven automated follow-up system, it would more than pay for itself. And based on the statistics, this system could make you tens of thousands of dollars just this year (and continue to work for you for years to come!). Let’s have some fun and run the numbers. If you work a bridal expo and get 50 leads, and you don’t follow-up, based on the statistics you’ll get ONE new client. If you follow-up three times, you’ll get 2-3 clients, but if you follow up 5-12 times, you could get as many as 40 new clients!! Now the reality is… you probably wouldn’t know what to do with 40 new clients!! But, if you have 40 people who want to hire you, you can be very picky and only accept the people who are your IDEAL clients. A bridal show can be a GOLD mine of dream clients for you, IF…and only if… you have a proven follow-up system in place. Considering that most couples are engaged for 13 to 18 months, you have plenty of opportunities to stay top of mind. This proven system is probably the quickest easiest way to boost your revenue this year and work with more dream clients. Your follow-up system can be simple and automated. Creating and implementing it does not have to take hours and hours of your time. In fact, it shouldn’t! To make it really easy for you, we developed a Bridal Show Follow-Up System just for you! Purchase your Bridal Show Follow-Up System by clicking the button below. You’ll get an email within 15-minutes inviting you to log into the MTE Vault (our member-only website exclusively for Travel Agents). 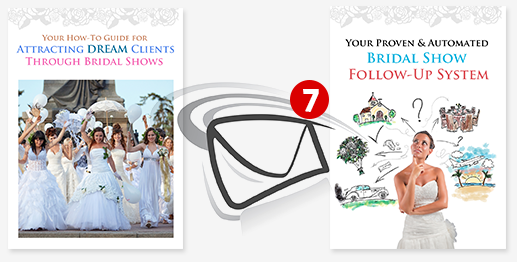 Log in, click on the icon that says “Bridal Show Follow-Up”, download your short easy-to-follow how-to guides and set up the emails in your email marketing system. Your next step is to research bridal shows, book them, show up, follow the system, and get a plethora of new DREAM clients! Ever since I started the Bridal Follow Up System, my phone has been ringing off the hook! I have never been this busy before. This proven system is just one-payment of $97. If you get just one extra new DREAM client from this system, it would way more than pay for your entire automated follow-up system. What if you get a gold mine of new DREAM clients? This just might be one of the best investments you make in your business this year.